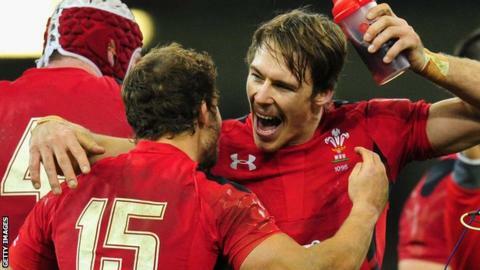 Liam Williams will add an extra running threat from full-back for Wales following the World Cup-ending injury to regular 15 Leigh Halfpenny, says former Wales back Rhys Williams. Williams agrees that the absence of Toulon's goal-kicking star Halfpenny with a knee injury is a big blow. But the 44-times capped full-back or wing says namesake Liam can add a cutting edge to the Wales backline. "He's a player that can create something from nothing," Williams said. "He has been one of the biggest attacking threats in Welsh rugby over the past couple of years, so to have him fully fit now is key for Wales in the World Cup. "Liam Williams becomes key at the back as an attacking threat and as a last man in defence as well with the injury to Leigh Halfpenny. "[Halfpenny] has become a pivotal and important player for Wales over the years with his goal-kicking success rate. "Without a doubt he does convert the points with the pressure that our defence is able to exert on teams, especially in the closer games where kicking becomes a pivotal part of the game plan." Scarlets full-back Williams has not played since having foot surgery in June, but he has been cleared to return to action and is expected to start Wales' World Cup opener against Uruguay on 20 September in Cardiff. Rhys Williams says the game against Uruguay might be enough for the 24-year-old to cement his place for tougher pool tests against England, Fiji and Australia, but is confident Wales coach Warren Gatland has other options in his squad. "As a player you can tell from training where you're at, whether you're 100% over the injury, but he probably needs to play that Uruguay game to get that game fitness, confidence, awareness, forget about that injury and progress into the tougher games," Williams told Radio Wales Sport. "There's a number of people he can slot back there if needed: Matthew Morgan can cover there, Hallam Amos can go back there as well. "So it'll be important for Gatland to see how Liam has recovered from it all." Halfpenny was injured in the final warm-up game against Italy, which also saw scrum-half Rhys Webb suffer a foot injury that also rules the Ospreys out of the tournament. "Like every Welsh supporter my heart sank when Rhys Webb was stretchered off and then to watch Leigh Halfpenny to be stretchered off as well, it was a real downer, and you just feel for the players," Williams added.